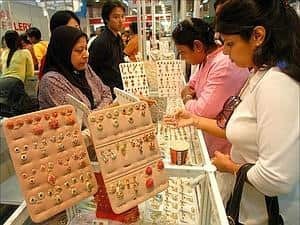 Jewellery stalls from Iran and South Asian countries are great crowd pullers. Are you one of those who always wanted a taste of the varied cultures of India, but never got the chance to take a round-the-country trip? Well, here’s a chance to experience India (and a couple of other countries, too) at one place—the 28th India International Trade Fair (IITF). Held at the centrally-located Pragati Maidan in New Delhi, IITF is like a mini-India. Enid Blyton fans may liken the annual experience to the Land of India atop the Faraway Tree, with all sorts of goodies from each of the 28 states and seven Union territories at their doorstep. As Indians, we are, after all, born and bred into the belief that unity in diversity is the essence of our identity. And in these brother-kill-brother times, what more could be the need of the hour than a platform where all the states in the country come together in a rare display of camaraderie, where regional differences are effaced amid the babble of cheerful bargaining, and where the tantalizing wafts of culture curry keep spirits high. With visitors reaching at least 2.3 million in the past, the quest for the perfect purchase at IITF will be challenging but its your best bet if you’re looking for the real McCoy. With as many as 38 countries showcasing their wares—from Vietnamese brocade, flower pots from Thailand, crystal products from Istanbul, and of course, Chinese consumer electronics—you are sure to be spoiled for choice in terms of consumer eclecticism. Even if you want to stick to the familiar, there’s always room for surprises. Take, for example, everyone’s favourite stall Saras, which is putting up a theme pavilion displaying saris and dress material from around India. You can liaise with rural artisans, the backbone of India’s thriving handloom industry, whom Saras provides a platform to display their products. 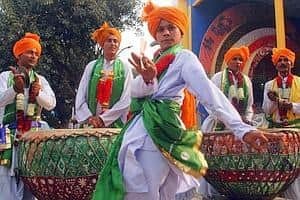 Folk dances are an integral part of IITF. The other popular venues are the Good Living halls, where one can find anything from common kitchen utensils to marble sculptures; the Rajasthan pavilion finds itself a top place on popular radar with the food stalls being probably more popular; and the electronics pavilion is always a good place to shop around if you’re looking to refurnish your house. At a time when India’s defence systems are the talk of the global-town, take a walk around the defence ministry’s pavilion for a look into history and the future of Indian defence systems. And how can one forget the food. Pamper the glutton in you with some rare delectables from typical pickles from Gujarat and Rajasthan (dal, bati churma, theple, etc., are available, of course), melt-in-your-mouth butter fish from Benfish in the Bengal pavilion, or try the popular mutton gosht and kebabs from Pakistan, which are here for the second after getting a "brilliant response" last year. Pakistan, which is also the partner country for the fair is also much visited for its jade and marble furnishings and decorative items—ideal for gifting or add that Persian glamour to your living room. 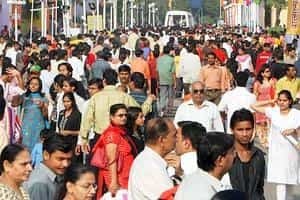 At least 2.3 million people visited IITF last year, and the number is expected to grow this time. With China forming the biggest delegation of overseas visitors, it is recommended that all those looking to make a good business deal head for that English-Mandarin dictionary to tell their P’s from their Chi’s. Around 7,500 companies are participating in this year’s fair. Rest assured, a heady mix of business and pleasure is what you’ll get, whichever way you’re inclined. The mornings are reserved for the doyens of the trade industry to rub shoulders and talk shop. If one cringes at the very thought of parking, metros will run with increased frequency for the duration of the IITF (14-27 November). So get your pass to a voyeuristic fortnight around the world with your feet planted firmly on home soil. The India International Trade Fair will be on at Pragati Maidan, New Delhi, till 27 November. 10am to 1pm: business hours, 1-8pm: open for all. Tickets are available at the venue, the Indraprastha metro station and at select Mother Dairy outlets across the Capital.